As a leading business expert and cancer survivor, Clayton M. Christensen provides you with his unique insight on how to lead a life that brings both professional success and genuine happiness. 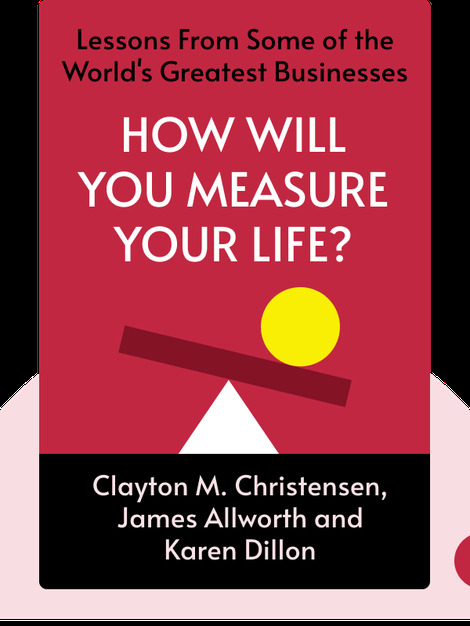 In How Will You Measure Your Life?, Christensen touches on diverse topics such as motivation and how you can harness it, what career strategy is the best for you, how to strengthen relationships with loved ones, and how to build a strong family culture. 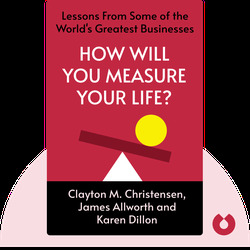 Clayton M. Christensen is a critically acclaimed author of several books and the Kim B. Clark Professor at the Harvard Business School. James Allworth is a graduate and Baker Scholar at the Harvard Business School. Karen Dillon is an American investigative journalist and former editor of the Harvard Business Review. She was named one of the world’s most influential and inspiring women in 2011.